We recommend this style of fin for all swimmers as they give you good propulsion and support when performing drills - which is the primary purpose of using them. 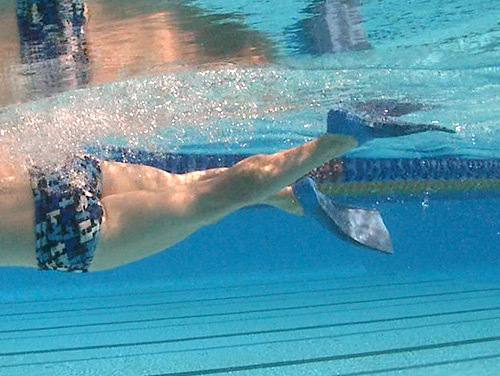 Shorter flippers such as zoomers can work well for elite swimmers but for most of us they do not provide enough propulsion for stroke correction work. It's critical that you feel well supported when performing drills so you can focus fully on the drill and not be worried about kicking hard enough to move forwards. - Choose something 'mid length' - i.e. longer than a zoomer but shorter than a full length scuba fin. - Make sure they are made from a soft and flexible material such as rubber. Some fins are made from plastic which is much stiffer and places a lot of load on your ankles and feet. If you suffer from cramping in the foot with fins then a softer material should help. - For some reason we've never understood most fins are slightly smaller than stated. So if you have size 9 feet, you're probably best going for a size 9-11 pair rather than a 7-9. There seems to be a school of thought out there that you should never use fins as they are cheating but nothing could be further from the truth. When used with a specific purpose in mind they are extremely valuable to help you develop your stroke technique in ways that would otherwise be very hard to achieve. New movements in swimming can feel very alien so it's important that you are able to really relax to get the feel of them. As a rough guide, in the Swim Smooth Squads we use fins for about 400m at a time for structured drill work. We do this with all our swimmers, from the relative beginners right up to our elite swimmers such as Jono Van Hazel. As an added bonus, using fins regularly helps to develop and maintain their ankle flexibility which is key to efficient freestyle swimming. Not allowed to use fins at your pool? This is a frustrating problem to have and you can find our suggestions about it here. Fins like these are easy to find in Australia but we know that in recent years they have largely disappeared from the UK and European markets. So a big shout out to Finis for introducing them again. What rate of improvement can you expect from your swimming fitness training per week? And if you miss a week, how much do you slip back? So, if you've just had a 5 week break from training it will take you about 10 weeks to get back to where you were before the break - really highlighting the importance of consistency in your training! These gains and losses show up most clearly at your CSS or threshold pace. If you use a Tempo Trainer Pro or Wetronome to pace yourself through these sets (see below), adjust your pace before your training session using the rule above. Based on your previous training (or lack of it) speed up or slow down the beeper in anticipation of your change in fitness. We've trained a lot of athletes over many years and this rule of thumb normally works very well. However, if you are new to fitness training in swimming, you may initially improve more quickly than 0.5 second per 100m. We know that many of you have been using CSS training sets to improve your swim specific fitness and have seen some huge improvements in your swimming performances as a result. For example, Alen Pezzin in our squad improved his speed by 13% in 10 weeks, dropping from 1:47 to 1:32 / 100m at threshold! lap to set you a target pace. Using a Tempo Trainer Pro in mode 2 is a great way to pace yourself accurately through these sets but did you know you can also use mode 1 to become even more accurate with your lap time? You can then adjust your lap time in 0.01 second intervals allowing you to be really precise with your pacing. The original mode 2 only allows whole seconds at a time, equating to a change of 4 seconds per 100 in a 25m or 25yd pool. That's OK but if you want to adjust things by 0.5 second per 100m you need to be more precise by using mode 1. You can find out more about CSS training here and the Tempo Trainer Pro here. What makes a great training session from a psychological point of view? A coach we work with closely in Montréal, Charles Gaston-Couturier, describes the challenge of a good training set using something he calls 'Sweet Uncertainty', based on work by Brunelle in 1988 . 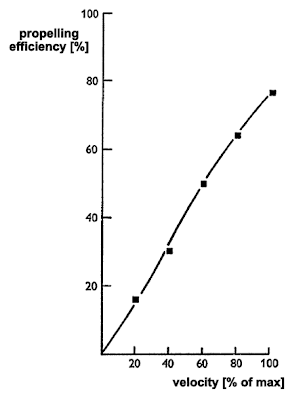 To the left side of the graph we have a goal that is so far within your capabilities it is too easy and boring. On the right side is a goal so hard you know it is impossible to complete, to attempt it would be futile. Somewhere in-between lies a tough challenge, one you're not sure whether it's possible to complete or not, a challenge that once set becomes very motivating. The most common example of this form of motivation is when you set yourself a race or event goal, for instance "Next year I want to swim that hard 10km race" or "I want to complete an Olympic Distance Triathlon in 2:30". 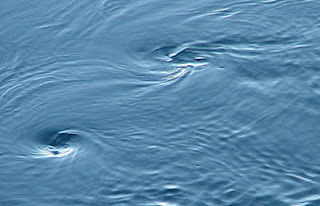 "The flow state is being completely involved in an activity for its own sake. The ego falls away. Time flies. Every action, movement, and thought follows inevitably from the previous one... Your whole being is involved, and you're using your skills to the utmost." In the sporting world we know the flow state as 'the zone'. Attempt something too easy and we become bored but try something too hard or beyond our skill level and we become anxious and demotivated by the futility of trying. Both extremes make it impossible for us to enter the zone, instead we need that point of uncertainty somewhere in-between. What is interesting to note is that this form of goal setting motivation (known technically as 'extrinsic self determined') doesn't just exist for mid and long term goals, it works session by session too. So if you are bored or lacking motivation, try setting yourself regular mini-challenges in your training. This could be a set you haven't tried before or times and distances you are not sure you can complete. It might be leading your lane in the squad through a CSS set or matching a training partner who is slightly quicker than you. Such challenges don't need to be set in every session because looking forward to them will motivate you in other sessions building up to them. But find that point of sweet uncertainty and motivation (and flow) will be yours. As you swim, have you ever wondered how much of your arm stroke effort is wasted? What percentage really goes into pushing you forwards through the water and what is lost as water movement down, to the side and into eddies? The technical term for this is ‘propelling efficiency’ and it makes a direct contribution to your overall efficiency as a swimmer. If more of your effort creates forwards propulsion and less is lost as water movement then you become a faster and more efficient swimmer. When you work on your catch and pull technique to press the water backwards with good timing you are working on improving this propelling efficiency. Last year we designed the exciting new range of HUUB wetsuits with Dean Jackson and top sports science Professor Huub Toussaint (we liked his name so much Deano named the company after him!). As well as a guru on minimising drag in wetsuits, Huub is also the world leading sports scientist looking at propulsion in swimming. In 1990 he conducted a study comparing high level swimmers and triathletes in the water . The results were fascinating. At the same swimming speed, the triathletes converted 44% of their work output into propulsive power whilst the swimmers converted 61%. A very large difference in propelling efficiency highlighting the superior stroke technique of the swimmers over the triathletes. This study looked at national and international standard athletes. However if you are a little lower down the pecking order yourself then you can expect your propelling efficiency to be lower with the majority of your effort lost into the water. Your figure might be in the 10-40% range. At the other end of the spectrum, Huub has measured propelling efficiencies as high as 80% in Olympic swimmers at racing speed. Huub's study compared swimmers all moving at the same speed. What happens to your propelling efficiency when you vary your effort from slow to fast swimming? You may find the answer quite surprising: As you work harder, your propelling efficiency improves and as you slow down it gets worse. In other words, if you increase your effort (e.g. by 10%) you get a greater return in propulsion (e.g. great than 10%). Conversely, drop your effort by 10% and you lose more than 10% in propulsion. We have to be careful with this data as it relates to fish not humans but the strength of the relationship is striking. At slow speeds over 80% of their effort is lost into the water whilst when moving quickly they become much more efficient, losing only 20%. The hydrodynamics of why this happens is complex and beyond the scope of this blog but the key point to appreciate is how been overly gentle with the water is actually extremely inefficient. Much of the information out there in swimming books and on the internet purely focuses on decreasing your drag to make you a more efficient swimmer. For that reason it’s hardly surprising if in your mind you equate efficiency with reducing drag but really that’s only half the story. Your overall efficiency is a combination of your propelling efficiency and your drag profile. It’s important to appreciate that both elements are of equal importance, not one over the other. If your propelling efficiency is poor then you can work all you like on reducing drag but you will only make small improvements in efficiency. 1) To become a more efficient swimmer, work on both your propulsive technique (e.g. catch and pull) and reducing drag (e.g. balance, alignment and kick). Don’t be sold on the idea that one is more important that the other or more of a priority to improve your stroke efficiency. 2) As we discussed last week on the blog be careful with the notion of swimming ‘effortlessly’ to become more efficient. As we have seen above, swimming too gently actually reduces your overall efficiency. This is one of the main reasons why swimmers trying to glide effortlessly down the pool become very frustrated with their lack of speed. 3) Don’t become a ‘technique hermit’, shunning all swim specific fitness training and solely focusing on swimming drills. The more swim fit you are, the higher effort you can sustain and therefore the more efficient you will be. Swim fitness is a vital ingredient of an efficient swimmer! 4) A key area of development for the Bambino Swim Type is better rhythm in the stroke. Although this involves turning the arms over quicker, the result is normally a reduction in effort, not an increase. This happens because the Bambino has such a poor feel for the water that their propelling efficiency is very low indeed and by lifting their stroke rhythm this improves. 5) Don’t use this as an excuse to muscle the water, that’s not what we’re talking about here. Efficient propulsion is generated through pressing the water in the right direction with good rhythm and timing. Whilst it certainly does not feel effortless, the catch should not be a forceful movement either. Toussaint HM. Differences in propelling efficiency between competitive and triathlon swimmers. Med Sci Sports Exerc 1990;22:409-415. When Is It Going To Feel Effortless? Effortless is a word that is often used by swimmers and coaches alike. But what does it mean to you when you swim or see others swimming? There's a big difference between an elite swimmer *looking* effortless and them being truly effortless in the water. As a case in point, our real-life Mr Smooth Jono van Hazel, who competed at the Athens Olympics in 2004 in the 50m freestyle, looks effortless when swimming at 1:10 per 100m pace. And yet this is actually his 1500m race pace - not something he can sustain all day. If it was truly effortless, by trying a little harder he'd be able to challenge Sun Yang's 1500m world record, which of course he can't. The word effortless has been used in a well meaning manner by coaches for many years. The idea being not to fight against the water but work with it, as elite swimmers like Jono do. However, many swimmers have latched onto the notion that swimming should be truly effortless and as such they should never work hard in training or feel anything but very easy when they swim. When you are swimming it should not be without effort. Just like when riding or running, you can feel strong, smooth and rhythmical. You are working efficiently with the water but it's never truly effortless. Swimming wasn't meant to be that way.